What a pleasure it was to welcome back Dr Gino Moliterno for the fifth year in a row to expand our minds on the subject of Italian cinema of which he is an authority – he teaches the Film Studies Program at the ANU and has published a Historical Dictionary of Italian Cinema. 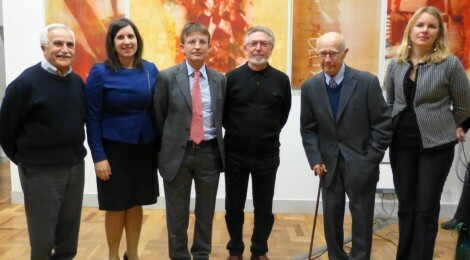 We were equally delighted to welcome a few special guests to our cultural evening: the new Italian ambassador to Australia Pier Francesco Zazo and his wife Svetlana; the principal architect of Parliament House Aldo Giurgola; and the Legislative Assembly politician Giulia Jones. and influences through excerpts from his most famous Oscar-winning films. He chose, instead, to focus on Fellini’s drawing and cartooning skills because of their influence on the films he was to direct before talking about his themes. Thus we learnt that instead of attending university when he moved to Rome, Fellini spent his time drawing and selling his drawings. In Rome he collaborated with the magazine Marc’Aurelio and drew cartoon books for the Funny Faces Shop; married Giulietta Masina in 1943 (remaining married to her for 50 years until his death, with Giulietta dying six months later) and met the Roman actor Aldo Fabrizi. That’s when he wrote the script for Rossellini’s film Rome Open City (1945), with Fabrizi as the main character. He subsequently worked with other great actors such as Alberto Sordi (for ex. in The White Sheik – 1952) and Marcello Mastroianni (in La dolce vita – 1960 – which, in Gino’s words put Fellini “in the stratosphere”, and 8½ – 1963). His own wife acted with Anthony Quinn in the beautiful La strada (1954). Gino took us through the cinematic career of Fellini (born in 1920, died in 1993) from the neo-realism genre of the forties to the autobiographical art-house films from the sixties. Fellini scripted and directed 24 films over a period of forty years – “all brilliant” according to Gino. Eight of these films received 11 Oscar nominations; five of them were awarded the Oscar (including La strada, Le notti di Cabiria, 8½ and Amarcord for best foreign film). And in 1993 just before his death Fellini was awarded an Oscar ‘For Lifetime Achievement’. We learnt that Fellini’s body of work is largely autobiographical and is often about memory, a theme he reflects on in the film L’intervista (1987). “There is a great deal of depth in his philosophy. […] In his films we move around in space as well as time (past and present are mixed) […] We are always recreating memories”. Indeed in one of his documentaries titled Sono un gran bugiardo (I’m a great liar) you wonder whether events “recalled” really happened or have been invented. We were shown two excerpts from Roma (1972). In the first we get the impression we are following works to extend the Rome underground , with relentless drilling and exploration of the dark tunnels until some frescoes of a 2000-year-old Roman house are discovered but as soon as light is shone on them, they lose their colour and are lost forever – perhaps an allegory of memories lost. Gino explained that the film was actually filmed at Cinecittà and not at all in the bowels of Rome. The second excerpt dealt with a fashion parade held in the Roman palazzo of a ‘principessa’, with the models being priests, bishops and nuns. The amazing scenes range from the deeply spiritual to baroque theatricality, from lightweight and entertaining to downright grotesque. Fellini was particularly critical of the church for its repression (especially of human sexuality) while also appreciating its ability to “put on a good show”. 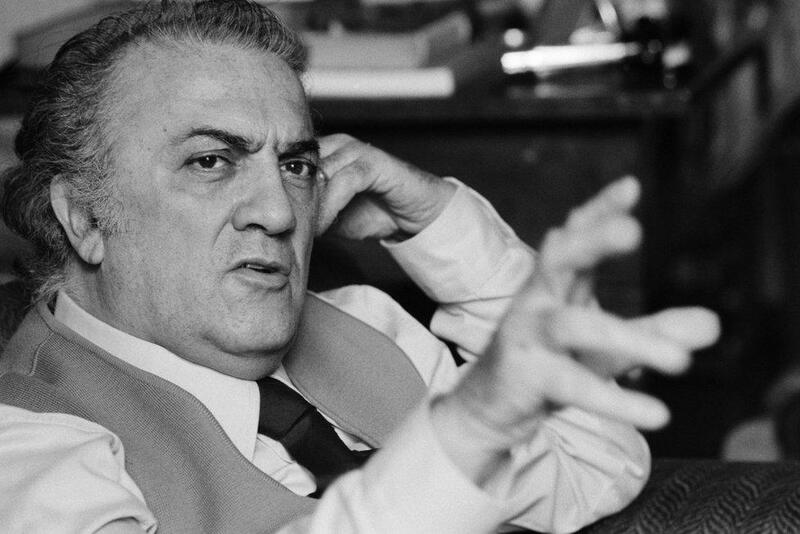 Interestingly, the Vatican did not request the banning of any of Fellini’s films, possibly because Fellini “had good connections every-where including inside the Vatican”. Gino also reminded us that we owe two words to Fellini: “Fellinesque’ to describe any kind of extravagant, fanciful even baroque image in cinema and art in general; and “paparazzo” from the name of a character in La dolce vita who pursues celebrities or society figures to photograph them in a sensational way. Fellini also provided inspiration to a great number of film directors. At the end of his presentation, Gino took some questions and comments from the floor including one from Aldo Giurgola. To another questioner, Gino explained that Fellini films are unlike Hollywood ones – they focus on the process and not the point of arrival. One either en-joys this experience or finds it too slow, boring or confronting – and walks out. At the start of Gino’s presentation there were about 50 members and guests present but the session went beyond the expected time (and we could have stayed another hour at least) so many had to leave before the end of the presentation. Many of those who stayed to the very end had the opportunity to talk to Gino personally to share their views or be further enlightened. The ambassador and his wife, Aldo Giurgola, Gino Moliterno and our president Franco Papandrea were the last ones to leave.